With Shazam! and Pet Sematary powering the box office last weekend, is there room for some more decent openings? Hellboy sure hopes so, as the new rebooted version looks to be the best bet for weekend numbers. Also looking to make a splash is the comedy Little, Laika's new animated offering Missing Link and teen romance After. While I don't think this weekend is going to offer nearly as many sparks as last weekend, I just hope it's enough to keep April chugging along strong until the eventual arrival of Avengers: Endgame. HELLBOY Taking on a Guillermo del Toro original is just asking for trouble, but I guess someone higher up thought Hellboy was a good enough IP to take a stab at it. While the first two Hellboy films are not exactly the pinnacle of del Toro's career, they were a lot of fun - and, let's face it, Ron Perlman was an exceptional choice to portray the large, red, cigar-chomping anti-hero. Those are some big shoes to fill, but David Harbour (maybe best known for playing the sheriff in Strangers Things) is sure going to try. 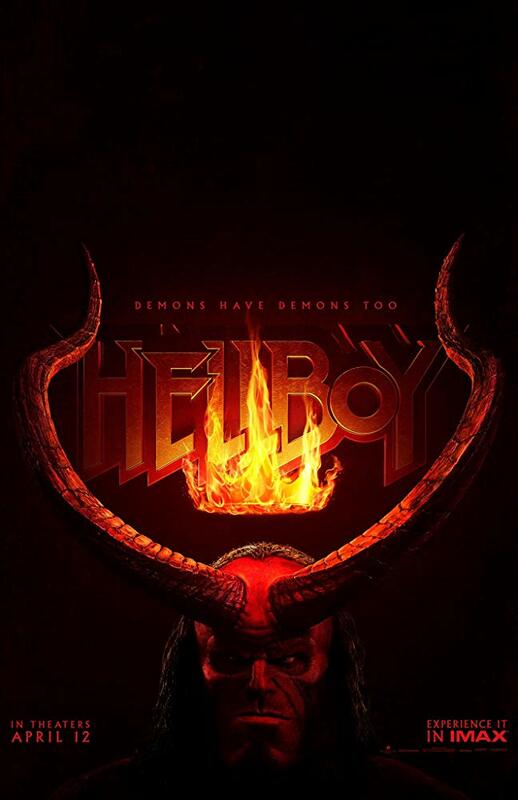 Directed by Neil Marshall (best known for Doomsday, I guess), the film also stars Milla Jovovich as Nemue aka The Blood Queen, who is all sorts of evil incarnate, Ian McShane as enigmatic leader Professor Bloom, Daniel Dae Kim as Hellboy's reluctant partner Major Ben Daimio and Sasha Lane as the girl with the special powers. Early reaction to the first trailer were mixed at best, with many faulting the sub-par CGI and questionable dialogue. While the latest efforts have been a bit better, early reviews are pretty harsh. The effects are still dinged, while the film has been described as incoherent and messy. And, of course, it has to compete with del Toro's version, which is just a hard mountain to climb. While Hellboy stands the best chance at the box office, if audiences aren't that excited about it, it could flounder. The hard R rating means it has also cut off a decent chunk of the younger teen audience that would otherwise support it. 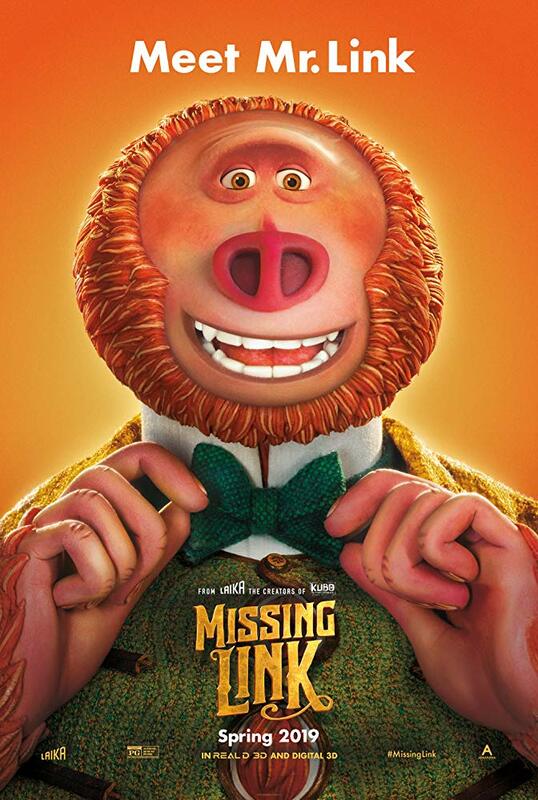 MISSING LINK If Hellboy gets overlooked, the most likely beneficiary will be the family-friendly Laika animated film Missing Link. Laika is a superb stop-motion studio, responsible for the likes of Coraline, ParaNorman and Kubo and the Two Strings. While not as popular as the likes of Disney or Illumination, Laika has carved out a nice little niche for themselves. While many of their animated films are a bit dark for the youngest set, Missing Link looks to be a bit more light-hearted than many of their previous films. Mr. Link (Zach Galifianakis) really just wants to be reunited with his family and with the help of explorer Sir Lionel Frost (Hugh Jackman) and Adelina Fortnight (Zoe Saldana), the trio travel the world to make his hope reality. Rounding out the vocal cast are Timothy Olyphant, Emma Thompson, Stephen Fry and Matt Lucas. If the animated film can carve a chunk out of Shazam! and Dumbo, and lure in some family crowds, it could do rather well. It has been four weeks since Wonder Park dropped, so it might be time for a new challenger for the animated crown. LITTLE While Shazam! has been compared to Big - combined with a superhero, Little is Big... in reverse. 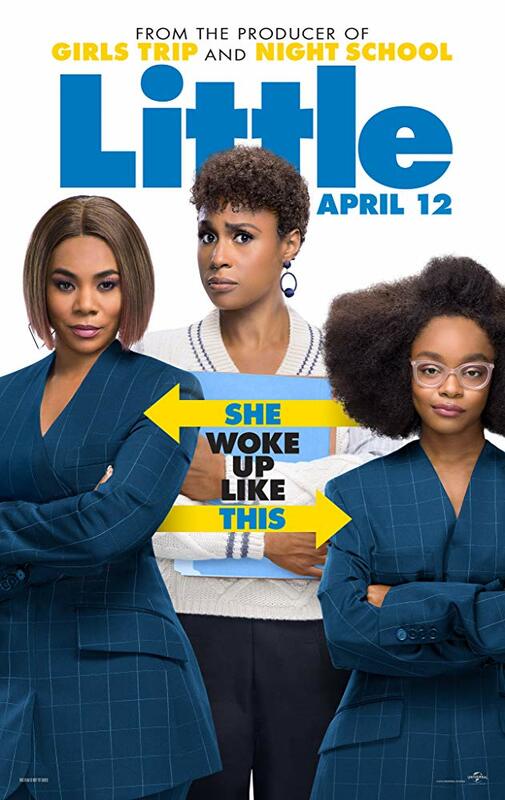 Instead of a young person inhabiting an adult body, Little finds the acerbic adult Jordan Sanders (Regina Hall) finding herself in the body of a young girl (Marsai Martin) while still retaining her sassy attitude. Her beleaguered assistant April Williams (Issa Rae) must somehow keep her in check, while maybe taking a little revenge in the process. The interesting thing about the film is that the youngest member of the main cast, Martin, not only came up with the idea for the film, but is also an executive producer! Considering the light budget on this, it doesn't have to be a major hit to make money and I have a feeling it will do just find among female audiences and those looking for a fun comedy. Because it's really the only film scratching that genre itch, it has a good shot at topping Missing Link because less competition means more eyeballs. Plus, it's great to see such passion and dedication from someone so young and I say more power to her and I hope for the best. 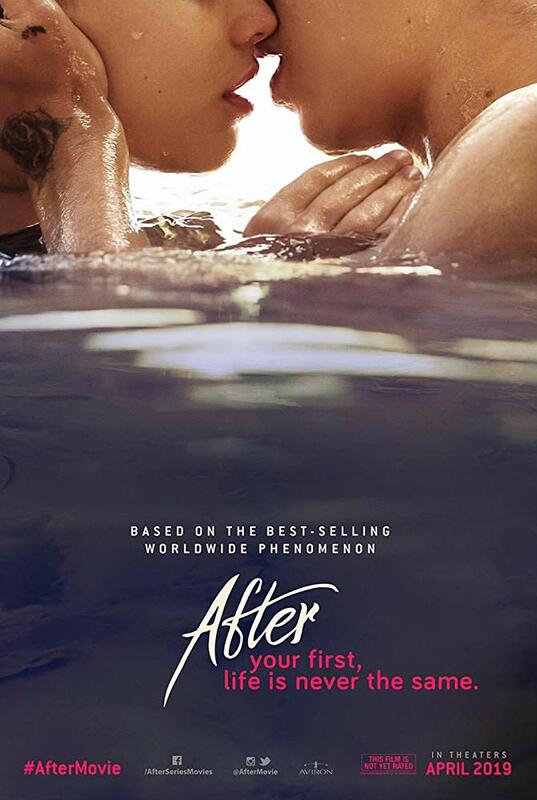 AFTER Based on the best-selling fan-fiction about members of the band One Direction, that had to obviously be changed for legal reasons, online sensation Anna Todd is having that fan-fiction-turned-novel adapted to the big screen. The film follows the prim and proper Tessa Young (Josephine Langford) as she leaves her mother (Selma Blair) and small-town life behind for college. She is immediately attracted to bad boy Hardin Scott (Hero Fiennes Tiffin) and they begin an unhealthy relationship that young adults will just eat up. This has been described as a kind of 50 Shades of Grey for the impressionable younger set... and that's just kind of disturbing. I don't know if the masses who ate up the source material will come out to support this or not, but I'm guessing it's going to wind up somewhere in the middle of the road at best and, seriously, that's probably for the best but there are plenty of other novels in this series, so if it does halfway decent, we're probably going to be getting more. Shazam! still has the best shot at the weekend box office as Hellboy doesn't look be able to scare up a big enough audience to challenge. it. Little and Missing Link should find a place n the top five as well. I'll be back on Sunday with the full breakdown.